Why is zone set up important? 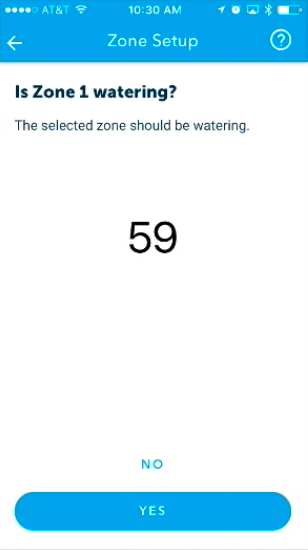 After completing the registration of your controller through the Rachio app, set up your zones for the most precise watering! 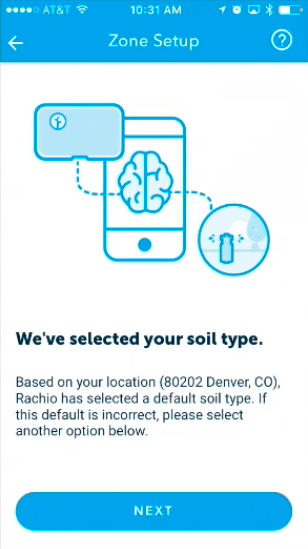 The information you provide helps Rachio create watering schedules that are tailored to your plants' needs and directly impacts plant health and water savings. To preview the zone setup steps in the video above, watch from 1:08. 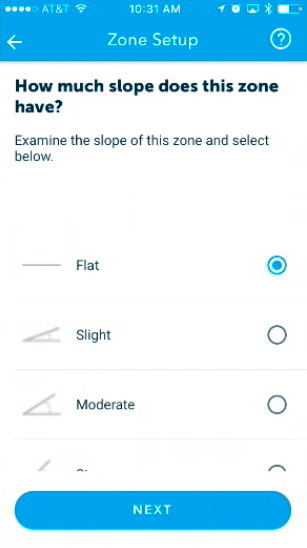 Begin by selecting "Setup Zones ". 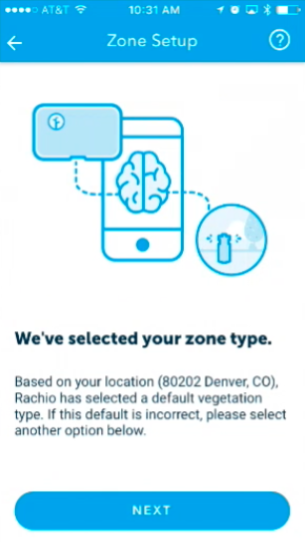 The app will work its way through all of your zones, beginning with zone 1. Begin by clicking "Next" on the screen below. The app will initiate a 60-second countdown. You will be asked "Is Zone 1 watering?" 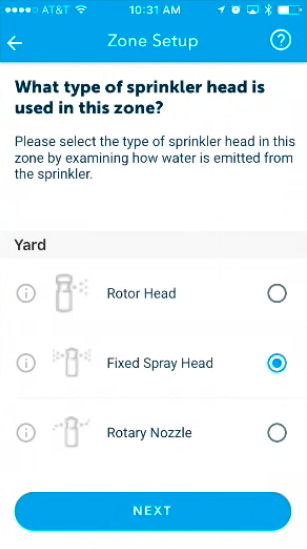 Click "YES" if your sprinklers are running. Click "NO" if the sprinklers don't turn on. Selecting "DISABLE" hides the zone from view; it will not be available when adding a watering schedule. 1) What would you like to name this zone? Add a photo for easier identification! 2) We've selected your zone vegetation type! Based on your location, we can select a default vegetation type. If this is incorrect, please choose another option. 3) What kind of spray head or nozzle does this zone have? 4) We've selected your soil type. Based on your location, we have selected a default soil type. If this is incorrect, feel free to choose another option. 5) How much sun does this zone get? 6) How much slope does this zone have? After configuring your zone, select "Next Zone" and repeat the same steps until all of the zones have been configured. Exiting / saving will override existing zone attributes. 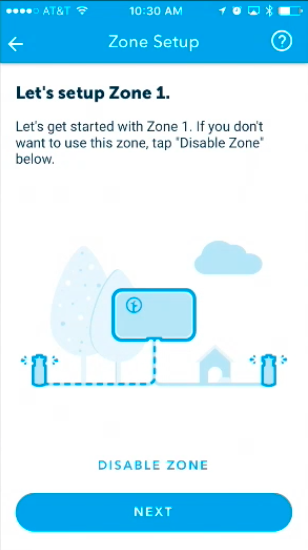 You can enable or disable a particular zone at any time - this is particularly useful if you would like to shut off a zone while troubleshooting an irrigation issue. 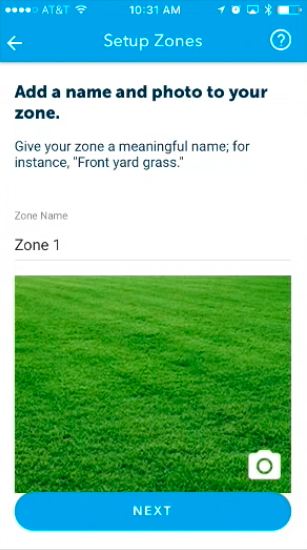 To enable or disable, go to the "Yard" tab and then select a specific zone by tapping on the zone card. This will take you to zone details. At the top of the screen, toggle on or off the "enabled" option. You can check if your zone is enabled by selecting the "Yard" tab. Zones that have been disabled will display a warning banner with "disabled" at the top of applicable zone cards.